After announcing its new iPhone 6s lineup on Wednesday, Apple has apparently discontinued gold and 128GB configuration options for previous generation iPhone 6 devices, leaving only Space Gray, silver and 16GB and 64GB versions left. Marketing chief Phil Schiller glossed over iPhone 6 availability during Apple's huge event in San Francisco, saying only that last year's models would receive the traditional on-contract price cut that brings iPhone 6 to $99 and the iPhone 6 Plus to $199. 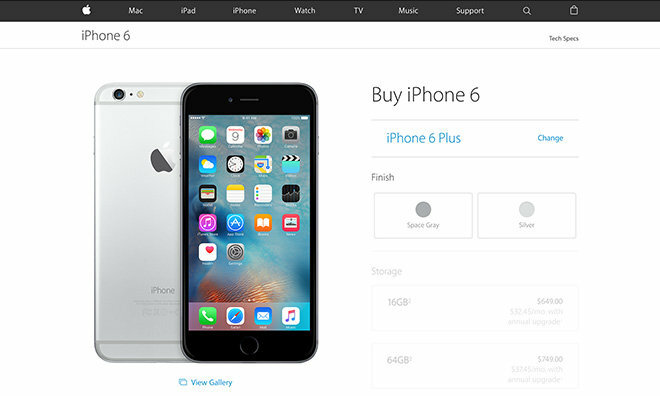 A graphic in presented behind Schiller does indeed show only Space Gray and silver iPhone 6 models, while Apple's web store now reflects the change. It is unclear as to why Apple chose to discontinue gold iPhone 6 production, though the move is likely an attempt to drive sales of its new iPhone 6s handsets, which come in Space Gray, silver, gold and, new for 2015, rose gold. With four colors to choose from, new customers and upgraders will have plenty of options when the device goes on sale next week. Aside from two extra shell colors, Apple's iPhone 6s and 6s Plus feature a number of enhancements like 3D Touch input capabilities, faster communications components, a haptic feedback mechanism, better cameras, faster Touch ID system and more.